Here's everything you need to know to ride as if you've been doing it all your life. A bus rapid transit (BRT) system, connecting Grand Rapids, Kentwood, and Wyoming, mainly serving the Division Avenue corridor. 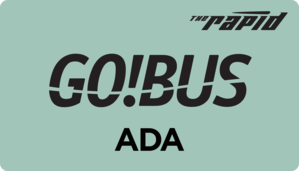 The Rapid offers programs designed to help those who need some extra assistance in using the bus. 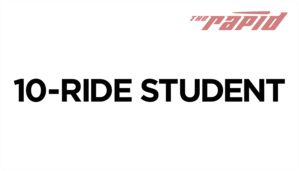 The Rapid offers service to area colleges and universities. Take the bus and your bike too! 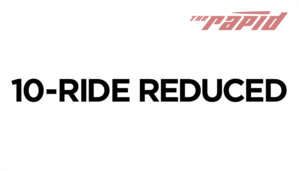 The Rapid offers a variety of digital resources to make riding with us simpler, friendlier, and smarter than ever before. Make your ride as safe and secure as it can possibly be. Learn the rules of The Rapid. Learn what to do if you lose something on The Rapid. Door-to-door mobility for seniors and the disabled. Call PASS to connect to The Rapid buses, and your destination. 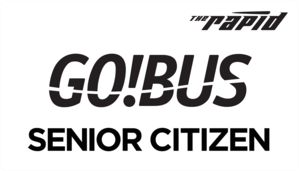 Special transportation for those aged 60 or older. 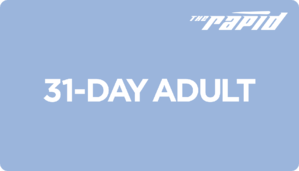 Even if you don't ride the bus, The Rapid can help you set up a car, bike, or van pool to get you there. Getting to and from the Gerald R. Ford International Airport is a breeze when you ride The Rapid. Free DASH routes connect key downtown destinations and parking lots. Visit our blog to find out the latest news and stories from the Rapid. With the arrival of The Wave, our new e-fare system, we are updating our terms of service. While many of the changes address the new interactions we will have with riders through The Wave, these updates apply to all interactions you may have with The Rapid online. Below, you will find the full terms of service in the column on the right. On the left is a summary of these terms — this is for your convenience, and any questions should be answered by examining the full policy on the right. By using our services, you agree to be bound by these Terms of Service. These terms cover your use of all of The Rapid’s services, including our website, The Wave e-fare system and related services. By using these services (even if you don’t register your Wave card), you agree to be bound by these terms of service. These Terms of Service form a legal agreement between you and The Rapid. These Terms of Service govern your use of all electronic services offered by The Rapid, including services offered through its website, mobile applications (“apps”) and other electronic services (collectively, the “Services”). These General Terms apply to all electronic Services. Additional terms apply to specific Services, and those additional terms are described below in Section II (“Specific Service Terms”). By accessing the Services on any computer, mobile phone, tablet, console, or other devices, or through use of an electronic fare card, you signify that you have read, understand, and agree to be bound by these Terms of Service, whether or not you are a registered Services user. We have the right to change these Terms of Service at any time. We agree to post a notice of the changes in the footer of our websites, and the changes will be effective 30 days after posting such notice to our website. Your continued use of the Services shall be considered your acceptance to the revised Terms of Service. If you do not agree to these Terms of Service, please do not use any of the Services. The Services are not a forum for public communication and debate, but a means for The Rapid to provide information relating to The Rapid services, programs, objectives, missions, and projects to the public and its customers. Your account may be created by you or by an employer, educational institution or other groups. If you are registered with another group, that group may have its own terms that apply to your use of your account. Either way, you are responsible for activity under your account. You may need to register for an account before using some of the Services. You may create your own account or an account may be assigned to you by an administrator, such as an employer or educational institution. If you are using an account assigned to you by an administrator, different or additional terms may apply and your administrator may be able to access or disable your account. You are responsible for any activity that occurs under your account. Keep your username and password secure and do not allow anyone else to use them to access the Services. The Rapid is not responsible for any loss that results from the unauthorized use of your username and password, with or without your knowledge. Our trademarks, service marks, logos and copyrights belong to The Rapid and cannot be used without our written permission. All content included on or through the Services, such as text (including blog posts, schedules, arrival information, fare information), graphics (including maps), designs, logos, presentations, videos, data, instructions, photos, and software (the “Materials”), is the property of The Rapid or its licensors. The Materials are protected by copyright, trademark, and other intellectual property laws. The Rapid and other trademarks, service marks, and logos that we use are trademarks of The Rapid. Third-party trademarks that appear in connection with the Services are the property of their respective owners. You may not use any of the trademarks displayed in connection with the Services without the express written permission of The Rapid. We are granting you a license to use our Services. This means you can’t sell, reverse engineer, circumvent or collect anything about users or our services that isn’t permitted. The Rapid grants you a personal, United States, royalty-free, non-assignable, and non-exclusive license to use the Materials provided to you by The Rapid as part of the Services. When a Service requires or includes downloadable software (such as apps), The Rapid grants you a personal, United States, royalty-free, non-assignable, and non-exclusive license to download the software onto your mobile device. These licenses are for the sole purpose of enjoying the Services and are subject to the license restrictions below. Impersonate any person or entity or misrepresent yourself or your entity in connection with the Services, or attempt to use another user’s account without the user’s permission. Some services may include links to third-party companies. We are not responsible for third-party websites or services. The Services may contain links to websites, applications, or other products or services operated by other companies (“Third-Party Services”). All decisions as to the placement of links to external sites or pages from the Services will be made by The Rapid in its sole discretion. The Rapid is not responsible for and does not endorse the content of any third-party website or service. Third-party websites are governed by the separate terms and privacy practices of such third parties. You access such Third-Party Services at your own risk. In the case of third-party apps, we list or link to them merely as a convenience to our users, and The Rapid does not sponsor or endorse these apps. We expressly disclaim any liability for these Third-Party Services. 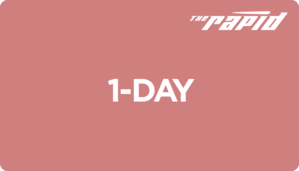 If you submit any content or feedback to The Rapid, you give us the right to publicly display that feedback. Any content you provide cannot violate the rights of anyone else, and you are responsible for any content you supply. We do not pre-screen content submitted by others, so we cannot guarantee its accuracy. We have no liability for content supplied by other users. In the event that you submit or post any creative suggestions, proposals, or ideas about our products and services, you agree that such submissions will be automatically treated as non-confidential and non-proprietary. We may use your feedback without any obligation or credit to you. You represent and warrant that your user content does not and will not violate these Terms of Service or the rights of any third party, including infringing or misappropriating any third-party intellectual property and publicity rights or violating the privacy rights of another person. You are solely responsible for your user content. We do not prescreen content posted by users and cannot guarantee the Services will be free from content that is inaccurate, deceptive, offensive, defamatory, unlawful, or otherwise objectionable. You acknowledge that we are acting only as a passive channel for such distribution. We have no liability relating to any user content or activities of users through the Services. Even in the event we choose to monitor any user content, we assume no responsibility for, or any obligation to monitor or remove such user content. If you have concerns about any content posted by another user, please contact us at: gro.temirt@ecivresremotsuc">info@RideThe Rapid.org. The appearance, position, and other attributes of the link may not create the false impression that an organization or entity is sponsored by, affiliated with, or associated with The Rapid or that views expressed on the website are those of The Rapid. The Rapid reserves the right to require that the linking website include a notice stating that it is an unofficial website and is not endorsed by, sponsored by, or affiliated with The Rapid and that any views expressed on the website are not those of The Rapid. We can suspend or terminate your Wave account, delete your user content, or restrict access without notice and without liability to you. We reserve the right in our sole discretion to (i) suspend or terminate your account, (ii) delete any or all of your user content, (iii) restrict your use of all or any part of the Services, and (iv) modify or discontinue any part of the Services, for any or no reason, without notice, and without liability to you or anyone else. We also reserve the right to block users from accessing the Services by using any technology available, such as blocking certain IP addresses or device numbers. If your Wave card is terminated within five (5) years after your card was purchased or value was added to your card, then the unused balance on your card will be refunded to you. You agree you are at least 13 years of age, have given us accurate information, are eligible to use the services, won’t use them fraudulently and will comply with all laws and terms of service. You represent and warrant that: (i) you are 13 years of age or older; (ii) you have provided accurate and current information about yourself; (iii) you are eligible to use the Services and have the right and power to enter into these Terms of Service; (iv) you will comply with all federal, state, and local laws; (v) you will not use the Services, directly or indirectly, for any fraudulent undertaking or in any manner that interferes with the operation of the Services; and (vi) you will comply with these Terms of Service. These sections limit our liability. This includes a legal warranty disclaimer, limitation on our liability and an indemnity clause. You should review these limitations. Although The Rapid strives to provide Materials that are both useful and accurate, the nature of the data and other information available through the Services is subject to frequent change. Accordingly, the Materials may not always be up-to-date, accurate, or complete. The Services and Materials are provided “as is,” “as available,” and without warranties of any kind. You use the Services and Materials at your own sole risk. To the fullest extent permitted by law, we disclaim all warranties of any kind, whether express, implied, or statutory, including, without limitation, implied warranties of title, quality, performance, merchantability, fitness for a particular purpose, accuracy, and non-infringement, as well as warranties implied from a course of dealing or course of performance. The Rapid does not warrant that the Services will be continuous, prompt, secure, or error-free. The Rapid assumes no liability for any errors or omissions, including the inaccuracy of content, or for any damages or losses that you or any third party may incur as a result of the unavailability of the Services. The Rapid assumes no responsibility, and shall not be liable for, any damages to your equipment, devices, or other property arising from your use of the Services. TO THE MAXIMUM EXTENT PERMITTED BY APPLICABLE LAW, THE RAPID AND ITS OFFICERS, DIRECTORS, EMPLOYEES, AGENTS, SERVICES PROVIDERS, AND LICENSORS SHALL NOT BE LIABLE TO YOU OR ANYONE FOR ANY INDIRECT, INCIDENTAL, SPECIAL, CONSEQUENTIAL, OR EXEMPLARY DAMAGES, INCLUDING, BUT NOT LIMITED TO, DAMAGES FOR LOST PROFITS, GOODWILL, USE, DATA, OR OTHER INTANGIBLE LOSSES (REGARDLESS OF WHETHER WE HAVE BEEN INFORMED OF THE POSSIBILITY OF SUCH DAMAGES), HOWEVER, CAUSED, WHETHER BASED ON OR UPON CONTRACT, NEGLIGENCE, STRICT LIABILITY IN TORT, WARRANTY, OR ANY OTHER LEGAL THEORY, ARISING OUT OF OR RELATED TO (i) THE USE OR THE INABILITY TO USE THE SERVICES OR ANY ERRORS, OMISSIONS, OR INACCURACIES IN ANY MATERIALS AVAILABLE THROUGH THE SERVICES; (ii) THE CONDUCT OF OTHER USERS OR THIRD PARTIES; (iii) THE PERFORMANCE OF THE PRODUCTS AND SERVICES PURCHASED THROUGH THE SERVICES; (iv) UNAUTHORIZED ACCESS TO OR ALTERATION OF YOUR DATA, CONTENT, OR PERSONAL INFORMATION; (v) ANY BUGS VIRUSES, TROJAN HORSES, OR THE LIKE THAT MAY BE TRANSMITTED TO OR THROUGH THE SERVICES; (vi) OR ANY OTHER MATTER RELATING TO THE SERVICES OR ANY PRODUCTS OR SERVICES MADE AVAILABLE THROUGH THE SERVICES. 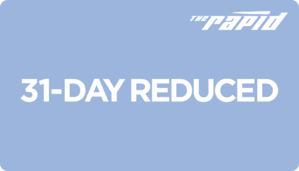 IN NO EVENT SHALL THE RAPID’S TOTAL LIABILITY TO YOU IN CONNECTION WITH THE SERVICES FOR ALL DAMAGES, LOSSES, AND CAUSES OF ACTION EXCEED $500. Applicable law may not allow certain limitations or exclusions of liability, so some of the above limitations may not apply to you. You agree to defend, indemnify, and hold harmless The Rapid and its officers, directors, employees, contractors, agents, licensors, suppliers, successors, and assigns from and against any claims, liabilities, damages, judgments, awards, losses, costs, expenses, or fees (including reasonable attorneys’ fees) arising out of or relating to your violation of these Terms of Service or your use of the Services, including, without limitation, your user content or any use of the Materials other than as expressly authorized in these Terms of Service. When you use our services, we will send you emails. You can opt out of most communications. If you sign up for service updates, you agree that we may send you text message updates. You can opt out of these. By using the Services, you agree to receive certain electronic communications from us, whether through the Services or by email. You may unsubscribe from certain communications at any time by clicking the appropriate link in the communication. You agree that any notice, agreement, disclosure, or other communication that we send you electronically will satisfy any legal communication requirements, including that such communications be in writing. All calls, emails, and other communications between you and The Rapid may be recorded and stored. All such communications from you shall be treated as user content hereunder. The Wave lets you pay for your fare on The Rapid fixed-routes buses. Wave cards don’t have to be registered, but registration gives you the benefit of certain functions like balance protection and automatic reloading. You can register at wave.ridetherapid.org. The Wave electronic fare system allows you to pay your fare by tapping your Wave card, an organizational identification badge or scanning your phone on the reader. These terms apply to your use of The Wave card and mobile app. If you purchase your Wave card at a retail location, no registration is required to redeem the fare or check the balance of the card. However, in order to access and use certain functions of The Wave mobile app, you will need to register an account. You may also register an account through The Wave website at wave.ridetherapid.org. Registration is required if you wish to (i) reload value on your card online or through the mobile app, (ii) protect your card’s balance against loss or theft, or (iii) manage your account. If you choose to register your Wave card (including cards provided to you by your employer, an educational institution, or other entity), the card’s serial number will be linked to your account. No more than 20 cards may be linked to a single account. These are details about some of the different options for adding money onto your Wave card, including Auto-Load. You may purchase Wave reloadable smart cards–and add value to the cards–at supermarkets, convenience stores, pharmacies, and other retailers. You select the amount of value to load, which must be an amount between $5.00 and $250.00. After initial purchase, registered users may load additional value (i) via the Wave website or app. Anyone may load additional value by visiting The Rapid’s Information Center. Wave cards are not, and do not represent, “accounts” or “deposits” and Wave cards are not “money.” They simply represent a prepaid transportation fare. You may not redeem Wave cards for money or any product or service other than the applicable services. AFTER FIVE (5) YEARS OF NON-USE, YOUR WAVE CARD WILL AUTOMATICALLY EXPIRE, AND THE UNUSED BALANCE WILL BE REMOVED AND RETAINED BY THE RAPID. FOR PURPOSES OF THESE TERMS, “USE” OF A WAVE CARD INCLUDES PURCHASING, REDEEMING OR ADDING VALUE TO THE CARD. SALES OF WAVE CARDS ARE FINAL AND NON-REFUNDABLE. Wave cards are not transferable. You may choose to enable automatic reloading of value to your Wave card by logging into your account, specifying the value to add when the account balance drops below a defined threshold. If you enable automatic reloading, you authorize The Rapid to automatically charge your payment card the amount that you have selected on the schedule you have selected. You may opt out of automatic reloading by changing your account preferences. You have to tap or scan your Wave card, smartphone or organizational identification card on a reader to redeem your fare. Any value loaded onto your Wave card is non-refundable. You can find card readers on board buses and at Silver Line stations. To redeem a fare, you may tap either your Wave card or scan your Wave mobile app at the card reader. If you lose your registered Wave card, let us know right away in order to protect your balance. The balance on unregistered cards is not protected. The Rapid expects you to take reasonable precautions to protect against lost, stolen, or damaged cards. However, we recognize that accidents happen. If you have registered your Wave card, you can report your card lost, stolen, or damaged and then The Rapid can transfer your balance from the lost card to a new card you acquire. Unregistered Wave cards do not offer the balance protection that registered Wave cards do. You are responsible for redeeming your fare and having proper proof of payment. If you don’t have your fare, you are subject to penalties including citation and exclusion. You are solely responsible at all times for proper redemption of fares and maintaining proof of fare payment in accordance with the rules of the applicable transit system. You understand that you will be subject to penalties, including, but not limited to, citation and exclusion, for failure to exhibit proof of fare payment. If you purchase and order tickets online, there are no extra charges—online customers are not charged for postage or shipping & handling. 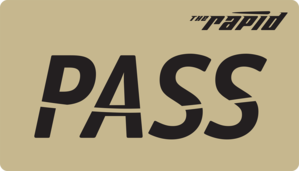 Passes are sent via U.S. Postal Service. We are not responsible for lost orders. For pick-up orders please allow 48 hours for processing. Fares are non-refundable. These terms apply to The Rapid’s online sales of paper tickets. Please allow up to 5 to 7 business days for delivery. Please allow 48 hours for processing when ordering tickets online to be picked up at the Information Center at Rapid Central Station. IF ANY PROVISION OF THESE TERMS IS FOUND TO BE INVALID OR UNENFORCEABLE, THEN SUCH PROVISION WILL BE INEFFECTIVE TO THE EXTENT REQUIRED FOR THE REMAINDER OF THESE TERMS TO BE ENFORCEABLE.